Event management software is the generic name for a wide range of software that is involved and used in management programs of corporate and other conferences. These businesses include trades, seminars, corporate meetings, exhibitions, academic shows, academic conferences and other basic and smaller events. An event planning software can be used in all sorts of management programs, academic conferences, events, and meetings where concrete and mindful planning needs to be done. This is professional work and cannot be done manually. Thus, event planning software is needed. Because all the tasks are now done on a bigger scale, manual selection or manual storage is confined to do limited or small tasks. The set of business solutions that cover various aspects of organizing an event has been continuing for decades. The only difference is that now it cannot be done manually. Everything is relocated to the system, and this event planning software focuses on your list and starts organizing the activities. 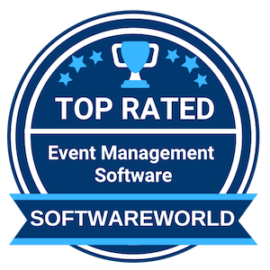 Here is the list of 20+ best event planning software for you coined by SoftwareWorld. What are the Best Event Management Software in 2019? About Cvent : Cvent is not just the best event management software but a technology that enables roadmaps for effective event workflow. Cvent offers complete designing, building, and managing event websites for corporate companies. The software is easy-to-use powerful online software that has managed to increase attendance and engagement while allowing easy navigation of every event process. Cvent helps the organization in planning and executing successful marketing events. “Cvent has improved our event participants’ experience during registration, with admin and group registration and automatic confirmation, receipt and invoice emails. Our team spends less time updating and monitoring registration. Parked reports allow our partners to check in anytime they’d like.” – Laura H.
About Eventzilla : Eventzilla is an all in one event management software that helps in planning simple set-up to advanced reporting on a single platform. Eventzilla is a mobile-friendly software and enables the users to sell event tickets anywhere on the social media platform. The software can be customized to set up customized questioners and increase audience engagement before and after the event. Using Eventzilla, audiences can view, edit, and download their event tickets and companies can focus on selling more tickets. “Big Ticket Platform For Any Size Event. Everything! It’s really easy to set up and to customize your event tickets. Plus the fact that you can do check-ins with a barcode scanner or your mobile phone gives your attendees a much better impression of your events.” – Edgar R.
About Zoho Creator : Zoho creator is not only the best event management software but also a multiple platform app builder. With Zoho Creator, you can either create your own app or get started with the built-in apps and templates. Apart from event management software, Zoho creator can be used to analyze, install, and customize apps. From event planning to promotion, personalizing invitation, selling tickets, display blogs and event calendars, check in attendees and scan unified data; Zoho creator performs all these incredible features and has many more in store. 4. Ticket Tailor – Event ticketing for events of all sizes. Low fees. No fuss. About Ticket Tailor : Ticket Tailor is one of the best ticketing platforms online that offers fully featured event management software for events of all sizes. Ticket tailor allows direct payment services through which ticket buyers can pay the clients instantly without keeping them waiting. For the lowest fees possible, Ticket Tailor provides huge savings and increases total revenue. Ticket tailor is a fair approach to ticketing along with the fully customized platform and on hand customer support. “Ticket Tailor provided the fastest and most comprehensive answers to all my queries. They made me feel very confident about setting up my box office. This is such an easy website to use and very intuitive. The Ticket Tailor Help Centre is also very good and most answers you can find in their FAQs.” – Lauren C.
About EZOfficeInventory : EZofficeInventory is an end to end event asset management software. The software keeps track and scans event assets over different locations and generate reports for better insights on events. EZofficeInventory is an intuitive interface to streamline event equipment. The features are designed to speed up the management process and enable asset tracking that rough cloud-based system. The software easily fits into any workflow system and can be customized to fulfill management needs. About Bizzabo : Bizzabo is the number one rated event management software that has been accredited with many awards for its initiative features. Bizzabo is a holistic platform that provides your team with all the necessary tools to create rewarding events. The software surfaces insights that help companies grow through successful events. Companies can now create marketing programs, design on-brand digital experience, and bring together vibrant communities to run impactful events. About Eventleaf : Eventleaf is simple, powerful, and reliable event management software with multiple platform approach. Eventleaf is both web-based and desktop event management platform that helps in creating impressive event web pages, send invitations, sell tickets, print badges, conduct survey, polls, share presentation, scan business cards, engage with attendees and perform various other functionalities. Eventleaf is accessible from anywhere and is easily shareable as well. About Evite : Evite is one of the largest digital platforms that help in creating impressive event management websites and invitations for corporate and non-profit organizations. Evite makes it easy to can create a digital experience by designing and sending invitations, keeping track of attendees, send customized messages, and track emails, texts, and messengers. Evite does a splendid job in making get together effortless and more memorable. “Evite has given me the best experience possible when it comes to sending out online invitations. It integrates with my Google contacts so that I always have emails handy and don’t have to go searching for them. It keeps my RSVPs all in one place, simple and organized.” – Lauren L.
About VoxVote : VoxVote is an impressive event management software that also doubles up as a mobile voting tool for the speaker or the event manager. VoxVote features an outstanding Audience Response system which is available for free. The software is available for unlimited usage with live graph results that displays how much your audience is interested in your event. Users can create instant questioners, create presentation slides, add images, clone the event, export data, combine questions in result view, and perform custom voting for corporate events. “I wanted to add an audience participation tool to a live event and Voxvote was easy to implement. It allows an unlimited number of respondents and many features which can be customized. It was easy to implement and the tutorial was helpful.” – Amy E.
About TidyHQ : TidyHQ understands the need for streamline work process and running a group for free flow administration. TidyHQ is event management software that has an endless group of volunteers, different peoples with diverse ideas; manage membership, meetings, to run the admiration without any obstacles. With TidyHQ, you get the best experience of renewing membership, selling event tickets, handling attendees, check RSVPs, and handle member-only tickets and content generation. About Weemss : Weemss is ticketing and registration software that allows you to become creative and focus on your events and make them successful. Weemss features impressive tools that allow you to promote, sell, and manage your corporate and personal events smoothly. Weemss is perfect software to manage every scenario of an event. Users can create ticket categories, assign varied prices, limit ticket sales, reserve seats, choose between individual registration and multiple tickets registration, and perform various tasks in 40 different languages. “Weemss offers an amazing experience. The user interface is great, easy and fun to use. Every functionality is there from coupons to special offers. The website integration works great on every platform and its design is so great and up to date that it fit perfectly within our website.” – Jeremie M.
About CONREGO : Conrego is efficient and best event management software that is empowered by affordable features and functionalities. Conrego offers to build registration forms for event participants and send mass invitations to expected attendees. Conrego is impressive software with customizable questioners that users can ask their audiences during live events. Through this software company and individual event, managers can acknowledge the presence of attendees, create print-ready badges, analyze and create reports for event insights, and enable smooth flow of events. About CourtReserve : Ever thought of reserving courts for tournaments and leagues? CourtReserve is a simple yet powerful court reservation software that helps in putting up events on sports, tournaments, leagues, and court reservations. The software is featured pack with customized schedulers, mobile apps, notification generators, membership tiers, website integration integrated payment options and much more. The software also offers 30 days free trial pack to help you get used to with the remarkable features. “Look no further beyond CourtReserve. It’s a very robust application and if that is not enough, the service is outstanding, not only with support, but the CourtReserve staff is very interested in hearing your suggestions or challenges and turning them into future enhancements.” – Scott M.
About Sched : Sched helps in organizing better events and handling mobile apps in one place. The impactful software customizes your branding and offers to publish your event schedules, details and collaborates with your team efficiently in order to pull off a successful event. With Sched, companies can increase audience attention through a customized questionnaire, manage check-ins; allow control sessions, and simple content management. “Excellent package and service. One-stop shop for event management: attendees, speakers/handouts, exhibitors, rooms, messaging, feedback, social sharing. Mobile-friendly site and app for participants to create/manage their schedules, submit feedback, share content, etc.” – James C.
About Eventdex : Eventdex is a solution to all the Event-related needs. The software is one of the best event management software which integrates all the important event functionalities and requirements at one place. Eventdex offers easy on-site registration services and business matchmaking which aids in making your event successful. The software offers lead retrieval and event registration features that helps in driving higher event engagement. This incredible software integrates beautiful event websites with robust designing that attract more attendees and makes the planning’s successful for your company. About Eventival : Eventival is for the artists who want to organize successful events for festival programs. The software is one of the best film festival management software that assists film creators, musicians, filmmakers to hold events and create their own screening schedules. The app is perfect key for the film fraternity who want to attract their regular audience and ask them to navigate through the festival programs. Eventival helps the guests to access through the itineraries, accompanying events, and check out the obvious guest list. About Gigwell : Gigwell is booking management software that features all the right tools to make an event successful. The app provides tools to maximize and is the right choice for artists and booking agencies. Gigwell has been the favorite app among some of the renowned speakers, live artists, and booking agents. The app helps in discovering new talents, sell tickets, track sales, and streamline booking process for any events. Through Gigwell, one can search through the most popular venue, festival database, and industry best on-going events on a global platform. “Great Overall Booking Solution. Love the fact that the entire process is all online. This greatly assists with getting contracts signed, returned & invoices paid on a timely basis. It has automated many of our functions. Not quite perfect, but definitely great to have.” – Jacque P.
About Evenium Net : Every corporate company needs to hold corporate meets for global success. Evenium Net is the right platform which features impactful solutions for event management and invitation process. Through Evenium Net companies can seamlessly integrate websites with database and CRM tools on a mobile or desktop device. The app is affordable, and a complete solution to carry out registration, ticketing and invitation process for successful events. “Simple to use, decent reporting, great for free events. It’s a very clean interface. The mobile app isn’t white label but that’s ok for most events. The screen casting is quite unique. Audience interaction tools are top notch.” – Mike D.
19. Eventboost – THE Event Management Software. About Eventboost : Eventboost is simple yet a different approach to event management software. The platform is free for 30 days trial period and covers most of the important features that fulfill a company’s need. Users can create events, manage registrations, customize invitations, and get confirmation on emails, and messages. The software enables screen monitoring of attendees and manages real-time statistics, reminders, and follow-ups. This app makes the company’s future ready by duplicating recurring events and handling the work flow smoothly. “The system is great! Easy to use, very flexible, we could adapt it for different purposes. It is really handling and intuitive. Anybody in my studio can use it and also my clients appreciated a lot. The redemption of my press conferences was much higher since I have used Eventboost.” – Andrea S.
About Splash: Splash is an end to end marketing technology that manages the event and has the power to carry out complex campaigns with ease. The main aim of designing Splash is to empower event management and derive revenues for the customers. Splash manages to execute and streamline event pages, campaigning protocols, capturing audience insights and measure event impacts. Splash helps in connecting and optimizing mobile part of event management programs and derives successful results. About idloom-events : idloom-events are an event management software power packed with professional and advanced tools. The software manages, automates the workflow, and handles all the key aspects related to event management. idloom-events create dedicated websites, manages reservations, registration, ticketing payments, on-site badge printing check-ins, and attendees data management. idloom events are an all in one solution for business of all sizes. The goal of idloom is to handle complex functionalities and bring out successful events for business growth. “Great platform to organize professional events. Very userfriendly, professional platform. We used it for a customer event and were able to set up a great looking registration page. Managing guests was very easy.” – Robrecht B. About EventBH : EventBH has a comprehensive approach to event management. The software is popular among modern planners who deal in business matchmaking, onsite event management, and lead retrieval management. The software gives attendees the engagement opportunity portal that they want. EventBH helps in scheduling, managing, and executing successful events. Clients can collect attendee information without engaging in accumulating business cards. EventBH does the entire necessary job for you and provides follow-ups to bring out successful events for you. “Ability to manage very simple and complex events. Integration of events, communication and association management systems. Client success manager that is assigned to your account is great to navigate best practices.” – Barbara S.
» Registration Software – Registration software allows companies to automate the process of registration of events, meetings, conferences and also streamlines the payment collection process. Among all other things, this software helps organizations with ticketing, online or on-site registration, and self-check-ins. » Webinar Software – Visual communication has made it easier for people to communicate. There’s something about visual communication which attracts people to pay more attention. Webinars use visual communication to portray classroom feeling and are the internet’s method of bringing making people more attentive. » Online Training Software – Online training is one of the great paths to increased sales and enhanced productivity for employees as well as employers. Companies have shifted from on-site training to online training with the rise of technology. » Online Conference Software – Video conferencing software is a necessary tool for business organizations. It helps in making remote work possible. Companies having multiple offices rely on video conferencing software to schedule and hold meetings.